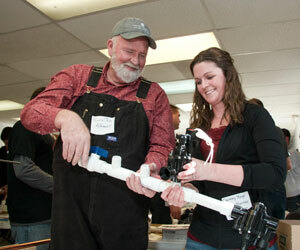 Twenty-eight high school teachers from the four corners of Colorado gathered in January for a skill-building session in irrigation basics. Teachers were given an Irrigation System in a Box containing all the components needed to build a complete system on a six-foot tabletop. Teachers assembled their systems in stages following presentations from industry pros Lyle Fair, All Phase Landscape, Kent Sondgerath, Denver Parks and Recreation, Star Fanning, Emerald Isle Landscaping and Nathan Clark, Colorado State University. At the end of the day, teachers left with their dis-assembled Irrigation System in a Box and the know-how to repeat the training with students. This was the first teacher training offered since the launch last year of the Landscape Career Pathway Program developed by ALCC in partnership with Colorado Community College System (CCCS). According to Michael Womochil, ALCC’s liaison with CCCS, there is much enthusiasm among high school teachers statewide to incorporate landscape skills into their career and technical education programs. Among teachers on hand for the training were Courtney Mayo, Green Mountain High School, Lakewood, and John Stahley and Desirae Weber, Platte Valley High School, Kersey. These educators have brought landscape skills curriculum into their classes during the 2015/2016 school year and enlisted ALCC volunteers to serve as advisors for their programs. The model for the table-top system was developed by Emerald Isle Landscaping (EIL) for in-house technician training. Emerald Isle also hosted the event in a new training room at their Denver headquarters. CPS Distributors, Inc. used EIL’s parts list and provided all the components at a substantially discounted rate. Colorado’s FFA Foundation provided lunch. Several from the industry told how their landscape careers developed. They included Emerald Isle CEO Rory Lamberton and fellow EIL team members: Annie Foley, Joe Ostrand, Josh Cyboron and Star Fanning. In addition, Lauren Bloom, Bloom Concrete & Landscape, Dan Farley, Renovations Landscaping and Scott Natter, L.I.D. Landscapes, were on hand to help teachers assemble their systems as well as share how their career paths brought them into the green industry. Ray Daugherty, Front Range Community College (FRCC) explained how students can extend skills-based learning via FRCC programs. New workforce generation, new business model? Do you have an employee suggestion system?